Click the tab headings below to learn more about regular and winter trout and kokanee salmon fishing here in New Mexico. In New Mexico coldwater species include trout and salmon. Catchable-size trout that have been reared at hatcheries are stocked in more heavily fished waters. Smaller trout and salmon are stocked where waters can better support their growth. Some waters suit native Rio Grande cutthroat populations, while other waters are better for naturally reproducing non-native brown trout, and still others that may be too warm during summer are cool enough in winter to be stocked with hatchery-raised rainbow trout. 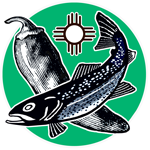 Trout water areas are displayed on the New Mexico Fishing Waters map, pages 10-11. See Fishing Licenses & Permits. (below the northern boundary of Christ in the Desert Monastery), Gila River (downstream from its confluence with its East Fork), Navajo Lake and the Rio Grande (downstream from its confluence with the Rio Chama). Baitfish use is now allowed in Regular Trout Waters (see page 7). • Bag limit of 5 fish is considered any combination of trout and/or salmon with the exception that no more than 2 lake trout and/or 2 cutthroat trout may be included in the limit. • Trout bag limit is 4 trout at the Tingley Beach Central Pond and the Children’s Pond. • Trout bag is 3 trout at Laguna del Campo, Red River Hatchery Pond, Red River City Ponds, Goose Lake and Rio Grande (Elephant Butte to Caballo Lake). • Possession of kokanee salmon not permitted at Heron Lake and Willow Creek during the closed season, October 1–November 7. • Bag limits may be different for Special Trout Waters. See pages 18–21. Any trout with red slash marks below the jaw is considered a cutthroat. A Gila Trout Fishing Permit is required to fish Black Canyon, Gilita Creek, Mineral Creek, Mogollon Creek, Sapillo Creek, West Fork Gila River (headwaters to East Fork confluence), Whitewater Creek, and Willow Creek (including tributaries). This permit is free and available online: www.wildlife.state.nm.us, by telephone: 1-888-248-6866 and at all license vendors and NMDGF offices. When water temperatures are cool, between November 1–March 31, Winter Trout Waters are stocked with hatchery-reared rainbow trout. Streams and Rivers: Black River (1 mile upstream to 1 mile downstream of Higby Hole); Pecos River (from the southeast boundary of Villanueva State Park downstream to Santa Rosa Lake); Rio Grande (Elephant Butte Reservoir to Caballo Lake). Lakes: Alumni Pond, Bataan, Bear Canyon, Bill Evans, Bosque Redondo, Bottomless Lakes State Park, Carlsbad Municipal, Carrizozo, Chaparral, Corona, Dennis Chavez, Escondida, Eunice, Greene Acres, Grants Riverwalk Pond, Green Meadow, Harry McAdams Ponds, Jal, Lake Van, Liam Knight Pond, Ned Houk, Oasis State Park, Perch Lake, Rancho Grande Ponds, Sumner Lake Stilling Basin, Roswell Kid’s Pond, Tingley Beach, Young Pond. Gila trout and Rio Grande cutthroat trout or increased harvest for nonnative fish species. Many STWs require artificial flies and lures with a single, barbless hook. Anglers must never disturb rocks, plants, or sediment to attract fish. Chumming and baitfish use are not allowed in any Special Trout Water. 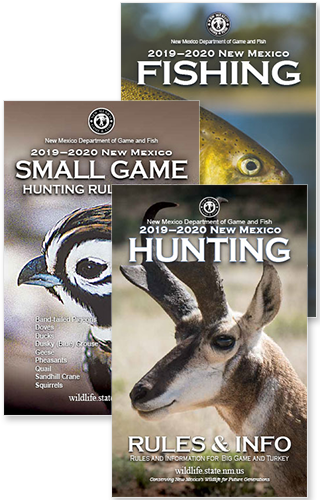 By following these regulations anglers help to conserve healthy fisheries in New Mexico and promote high-quality fishing experiences for everyone. 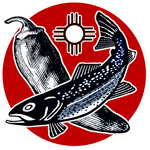 Keeping New Mexico TrueTM, the New Mexico Department of Game and Fish has established three designations for Special Trout Waters: Red Chile Water, Green Chile Water and Xmas Chile Water. Each designation is easy to remember, and signs with new symbols are posted at STWs with bag limits and tackle restrictions provided. Several Special Trout Waters have been established to help protect and conserve Gila trout and Rio Grande cutthroat trout. Nonnative trout species can outcompete or hybridize with native trout species. In order to protect native trout species, unlimited bag limits in some waters have been established for nonnative trout species (rainbow, brown, and brook trout). These waters are listed on page 20 under Red Chile (Native Trout Conservation). All fishing in STWs must stop when the daily bag limit for that water has been taken. Anglers may not continue to fish another STW with a similar or lower bag limit, but may continue if another STW has a higher bag limit or if fishing in Regular Trout Waters. Anglers must count those STW fish toward their overall daily bag limit. If fishing STWs where the bag limit is zero, anglers must not possess any trout. 1. and the fish quickly and don’t play it to exhaustion. 2. Use a landing net whenever possible. 3. Keep the fish in the water. 4. Do not squeeze or grab any part of the fish. Wet your hands first if you must handle the fish. 5. Gently remove the hook (barbless hooks are easier). 6. If the hook is swallowed deeply, cut the leader. A fish’s body fluids will dissolve the hook in a matter of days. 7. Let a tired fish recover. Hold it by the tail in the water with one hand and gently support it from below and just behind the head until it swims away. 8. Never toss or throw a fish back into the water. Kokanee are land-locked sockeye salmon. Although not native to the Southwest, kokanee thrive in some of New Mexico’s deeper and colder plankton-producing lakes. In late fall, large schools of four-year-old kokanee gather to spawn and die. A popular method for catching kokanee is snagging, the intentional taking of fish by hooking the body rather than the mouth. Kokanee are the only fish that may be legally snagged, and only during Special Kokanee Snagging Season. If another species is caught by snagging, it must be immediately returned to the water. Each autumn NMDGF collects millions of kokanee eggs and milt to fertilize eggs and hatch fry. The young fry are used to stock Heron Lake, Navajo Lake, Abiquiu Lake, El Vado Lake and Eagle Nest Lake. The success of these collection operations is essential to maintain vibrant and healthy fisheries for anglers to enjoy. As a result, Heron Lake, Willow Creek and designated no-wake areas at Navajo Lake are closed October 1–November 7, and no kokanee salmon may be in possession while fishing during these closures at Heron Lake and Willow Creek. October 1–December 31: Open at Abiquiu Lake, Rio Chama (El Vado Lake to west boundary of Rio Chama Wildlife and Fishing Area), Navajo Lake (excluding buoyed no-wake areas and shoreline within the no-wake areas at the Pine River Boat Ramp and Simms Boat Ramp), Pine River, El Vado Lake and Eagle Nest Lake. October 1–November 8: Closed at Heron Lake, Willow Creek and Navajo Lake (bouyed no-wake areas). November 9–December 31: Open at Heron Lake, Willow Creek and Navajo Lake.